Amazing app that teach you steps in an individual way to at later lessons show you how to combine those moves. Learning salsa is now easy!!! This is great for brushing up on some dance moves before heading out to dance. Been using this for a year so far and the patterns and breaks downs are amazing ! For those who want a quick guide on the floor or those who want to learn from the bottom up. Even for those who have already master salsa, this app is a must. Excellent variety of individual salsa patterns!!! ...on days when I'm wanting a new routine, I can pick and choose combinations and let them simmer. Then try them later. Lots of great and refreshing ideas. Love this app. Really awesome app! If you are a beginner on salsa you should get this! No regrets! Love everything about this app! It is well organized and the lessons are very easy to follow. Every salsa move in your pocket! 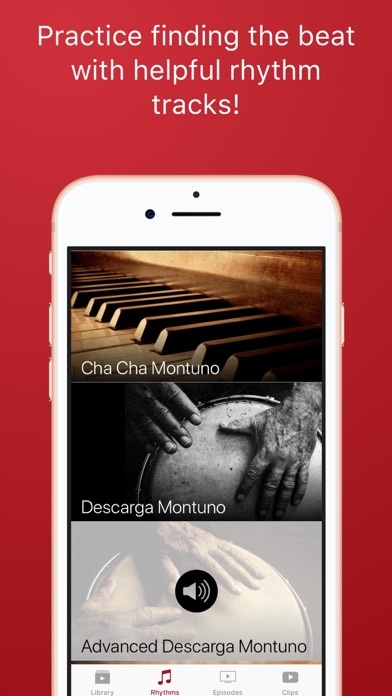 As an avid salsa dancer, this is a great app for when I want to learn new things! Awesome App!! It's not Shakespeare, but it's relevant. Exactly what people need. Fun easy to follow videos for beginners to advance salsa dancers. Nice work on this app. No BS, no gimmicks, just sweet, solid salsa dancing. Thank you. The app provides three different levels, and names the combos and moves which helps to remember a plethora of salsa moves. I use the rhythms to practice catching the 1 to different salsa tracks. Love that they let you download the videos so you don't crush your data. And it's not buggy! If you'd pay $14 per salsa class to learn anyway, this is a much more cost efficient way to learn. What an awesome app! The instructions and videos are clear and concise! ¡Muchisimas gracias! Im a beginner to salsa and I love this app because I can practice everywhere. It have everything we need to learn dance salsa. Very easy to follow and lots of cool moves. Well worth the money. Well done! Love how this app was put together. Especially how I'm able to download clips without streaming them all the time. Wanted this app because of the great reviews - unfortunately after purchasing, none of the videos download. There's just an error that says "Wifi Connection Required"... But I'm already connected via Wifi! Pros: The content is great. Essentially most of what you can find on YouTube, but organized in a logical fashion for progression. Cons: There is a problem with the coding of the app that stops you from downloading the videos. You get “Wifi connection required to download this video” even when you’re on Wifi. This makes you taking the videos on the go impossible. Really great app but are you going to update this app? Been crashing a lot lately. Needs some maintenance. Best Salsa App. Maybe Ever!! So easy to follow. Breaks everything down in just the right amount of detail. Although some moves that are in the beginner combos aren't covered until the intermediate tab, it's all there for you to watch and learn. Anthony is great teacher and adds his little jokes, whether intentional or not, which are always good for a chuckle. Great for all aspiring salsa dancers. Was under the impression that he taught the moves with both counts but THEY ARE ONLY ON ONE: Pretty disappointing because the content is great. Pocket Salsa is a great app. Salsa came so much easier when I used this app to complement my public and private lessons. They give you just enough to work on at one time...like one move! They do it so clearly, can't say enough about what a great and professional job they do! The content in this app is great, but I'm not seeing a way to play the videos to My television via AirPlay/Apple TV. Would be 5 stars with this feature. I am thrilled to have this app. Clear, easy to understand instructions. I also love that they go over the counts for On 1 & On 2. I am working with both, so it is extremely helpful. ...beginner; intermediate and advanced??? A step backwards for this app! Awesome app especially if you're a beginner, like myself. He's a detailed instructor and breaks the steps down to you for easy learning! Been using this app for a couple of years and built some good combinations. Instruction is very good. App needs an update. Plus no new content has been added in months. Not worth the money. What you get from this app would cost hundreds in personal lessons. Well worth it! I've had a heck of a time finding the salsa beat and this app has been a savior. Also, the app developer did a great job. It is very professional and easy to use, which I can't say for most apps out there. I’ve had this app for a couple of years and I love it the steps is easy to learn. And the instructors are great to follow. I recommend this app. The application is well developed, but please be translated into Spanish for Latin Americans. Love it! Very well explained from the man's perspective as a leader and from the lady's perspective as a follower. Also, they teach the women about styling to make their salsa dancing experience more beautiful. Both dancers are great. Love it. Use it daily. Always fresh, great tools for learning the basics, refreshing your skills, or movin’ to the next level. Keep it fresh! This is brilliant! Let's goooo! Love it. Coming from break dancing and house and jump style and tutting I love different dance styles and salsa is amazing! I first saw a few of these demonstrations on YouTube and they helped so much, I'm so happy that they have a whole app the compiled all videos into one easy place. I also love that they are divided into categories so that I don't get caught up learning an advanced move if I'm unsure of the basic pieces of it. Awesome app! Moves are great, fun and well explained- a need have for all leads looking for new combos on the dance floor. The videos have no audio. The videos have no sound. Yes, I checked the volume. I’ve uninstalled reinstalled the app. I hear sound from other apps. I do not hear any sound in IOS 11.4 and nothing has changed with IOS 12. Does any one else have this issue? I would have used a support link, but did not see one on your webpage. Very easy to follow and fun to do. This app is great for learning salsa because of the instructions given. I gave it 4 stars because I would have to pay for it again to use the app on Apple TV. Hola :-) I decided to buy the app after watching the a2s video clips on yt for a couple of days as way of saying thanks to the authors. And it turned out to be a welcomed and useful addition. Steps are easily explained with a ton of content. Kudos.